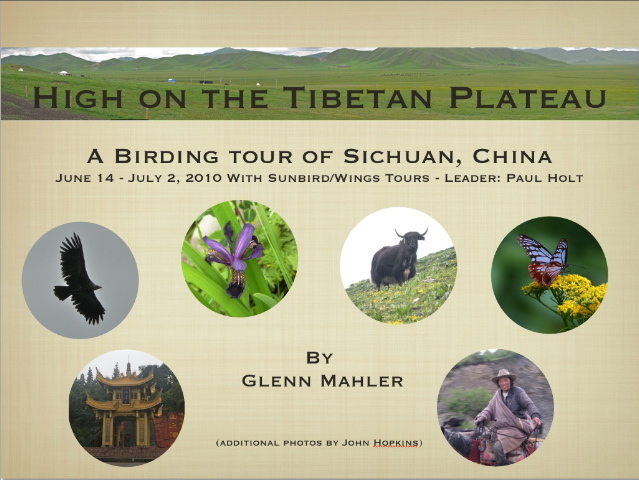 In 2010, club member Glenn Mahler visited the Sichuan province of China during a tour operated by the Sunbird/Wings Tours birding company. Glenn will be sharing some of the photos he took on this tour, which visited the higher elevations of the Tibetan plateau. His program will give viewers a glimpse of the diverse variety of birds, butterflies, mammals, and wildflowers found in the area, as well as a view of the peoples and cultures of this fascinating and spectacular region. Please join Glenn as he shares his experiences and photography with us.